If you are looking for your perfect window treatment, but still have yet to find the right one, it might be a good idea to make a list of what you are looking for then conducting research prior to making an online purchase. Take for example if you are trying to buy discount solar screen roller shades. First and foremost, they filter out 98% of the sun’s harmful UV rays while still allowing occupants a clear view to the outside world. This vinyl coated fiberglass shade is available in 3%, 5%, and 10% openness options to help homeowners create a more spacious environment with the perfect amount of natural light. From white to charcoal-bronze, there are countless color and customization options. At BlindsOnLine.com, our roller shades come in 7 different colors to match any interior. Furthermore, BlindsOnLine.com’s discount solar screen roller shades can be customized with a motor to automatically control lighting and temperature within your home. 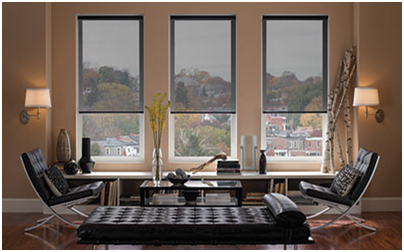 To learn more about BlindsOnLine.com’s discount solar screen roller shades, browse through our website. For a limited time only, we are offering a 10% discount off solar screen roller shades; simply input the code “SOLAR” on checkout. Have you ever wanted a window covering that would block the harmful rays of the sun while still allowing you to see the view to the outside world? Well, today is your lucky day because a sun screen roller shade will do just that. Sun screen roller shades, AKA “solar screen roller shades” were originally intended for commercial use but are now becoming one of the hottest residential window treatments on the market. You may have seen these shades in your local Starbucks or Boston Market place. Usually made from Vinyl coated fiberglass these shades are made from a mesh like material that has been designed to cut down the glare from the sun, while still allowing you to see through the window. These so called, “mesh shades” come in different openness factors, usually 3%, 5% and 10% that represent the openness of the mesh and will also determine just how “see through” the shades will be. During daylight hours these shades are very effective blocking the sun and allowing you to see the outside world however, the reverse is true when the sun goes down. If you are looking for a window shade that will give you 100% privacy at night then, these shades may not be for you. Just as you can see through the shades during the day, once the sun goes down those from the outside can see in. Of course the view to the inside is distorted but none the less you will still be exposed to some degree depending on the openness factor of your window shades. Sun screen roller shades are available in a multitude of colors and can be custom made to fit almost any window opening. The two most common types of Sun Screen roller shades are the spring roller and clutch roller (chain operated roller). Remote control motorized solar screen shades are also available for those hard to reach places or for those who just love gadgets. When selecting a roller shade I would always recommend the clutch roller first. The clutch roller is a heavy duty lifting system that will allow you to have the most control of your roller shades. By pulling on a circular lift chain sometimes made of metal and sometimes made of plastic you can stop the shade anywhere you would like and will also protect the shade from fraying on the edges which is common on spring roller shades. The spring roller shade is operated by pulling on the bottom of the shade to activate a spring mechanism that will raise the shade. With a spring roller shade it is sometimes tricky to get the shade to stop just where you would like it to stop and the shade must always be within reach in order to operate it. As for motorized sun screen roller shades they can either be hard wired or battery powered depending on the size of the shade. In either case these shades can be operated by hand held remote control or wall switch. Motorized window shades can also be integrated with most home automation systems that are being used to control lighting, and thermostats etc. When purchasing a sun screen roller shade you will be asked what openness factor you would like. The openness factors are usually 3%, 5% and 10% but can vary by manufacturer. The openness factor for sun screen roller shades refers to the openness of the weave. To try and put this in perspective let’s start by saying that 0% openness would be a solid shade that you can not see through at all. 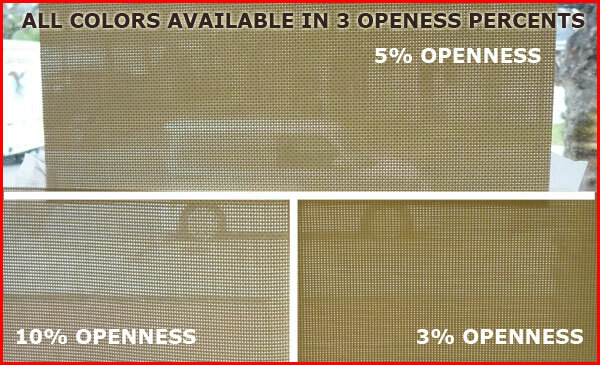 If you choose an openness of 3% you will allow the shade weave to open up just enough to allow you to see the outline of what is outside the window. By increasing the openness to 5% or even 10% you will be allowing more of the outside to be visible through the window shade. It is important to remember that the amount of sunlight coming through the shade will also increase as the openness factor gets larger. If you are having trouble selecting an openness factor for your sun screen shade, I would recommend the 5% openness for most applications. This will give you a fair amount of view through while cutting the glare from even the sunniest of windows. Remember the more open the weave the more you will see in to the house at night when the sun goes down. Sun Screen roller shades are a great choice for those who just do not want to lose the view to the outside while cutting out up to 98% of the suns harmful UV rays.